Spar Geo Infra uses advance and efficient techniques of grouting. It is an advanced and efficient technique of grouting. The word TAM stands for Tube-A-Manchette. In this holes are drilled around the circumference at equal intervals. Each hole is covered by a rubber sleeve which allow only one way (outward) movement of grout. It is possible to inject grout accurately at required locations. The manchettes, which act as one-way valves, prevent the injected grout from flowing back into the grout pipe under high grouting pressure. Thus perfect grouting effect is attained. It enables re-grouting, which permits the use of grouts with decreasing viscosities. This permits better penetration of the fine voids after the big ones have been closed. 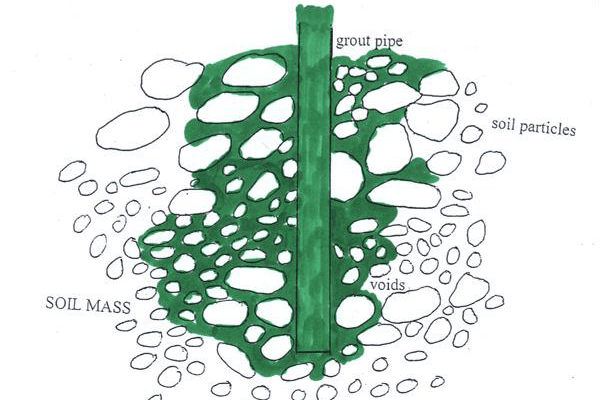 More permeable soil layers can be sealed first regardless of the order of injection level, which prevents loss of high-cost, low-viscosity grouts. The grouting operations are carried out completely independent of drilling which is very convenient for job execution.